Politics is CRAZY, son. We all know this. We're sick of the mud-slinging, the endless commercials, the fake gaffes, the REAL gaffes, the fact that important issues are being used as leverage in political games. It's annoying. It's frustrating. We're disillusioned. We just want to be able to turn on the radio without someone telling us that our choice of candidate is going to cause the apocalypse. However, we got this, guys. We're tough. We're AMERICANS, dammit. This is the beauty of our country: we can make our own choices - informed choices, even - and voting is a great way to make those choices count. Now, frankly, I'm about as tired of people who try to guilt you into voting as I am of people who are defensively apathetic about voting, but the bottom line is that you really should just FREAKING VOTE ALREADY. I'll admit, I don't have a perfect voting record (I've missed a primary or two) due to either ignorance or laziness. But I'm determined to do better. So simple, yet so freaking beautiful: he wanted a voter registration form. Now, I don't consider myself a blindly patriotic person. I know there are major flaws in our current political system. However, I'm involved in local politics in various ways and I know that there ARE good people working hard out there to better our communities. And I've always considered voting to be important, so this kind of thing, a man who cares enough about his new country to want to have a say in what goes on, gets me all choked-up-feeling. I just want to run to the top of the Statue of Liberty wearing a dress made of flags and shoot flags out of a flag cannon while singing "God Bless America." And honestly, the same thing happens when I step into a voting booth (the choked-up feeling, not the flag cannon stuff). Anyway, the transaction with the man at the library reminded me that Election Day is almost upon us (and the deadline to register for the NY primary is THIS SUNDAY). 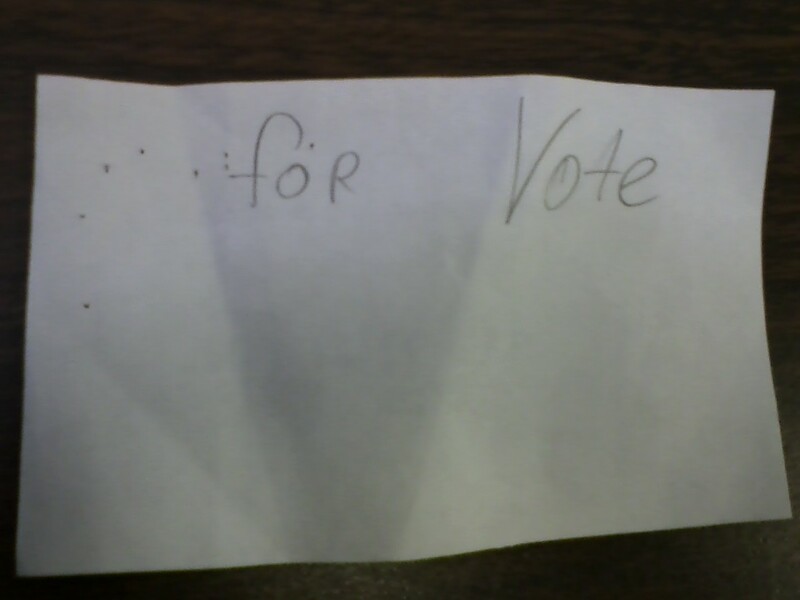 You see, there are other important things to vote for besides the Office of the Presidency. Whether you're a librarian or not, it's useful to know what the deal is with voting so that you can be informed and help answer peoples' questions. Since there's no United States of the Internet (yet), you guys will have to figure out the rules for your own state, should you need to. Below are a few helpful links. I'm not telling you who to vote for. I just think it's a good idea to vote, and kinda fun too. Besides, apathy is SO ten years ago. Do it for your country. Do it for yourself. I don't care. Just get out there. NOW WHERE THE HELL IS MY FLAG CANNON??? I love this post because I get choked up about this stuff too. And you're right - so simple but so beautiful. Thanks for cutting through all of the partisanship. Voting is important...no matter who you vote for.